Use of the website of the g2lab and/or HafenCity Universität Hamburg (HCU) is generally possible without any indication of personal data. However, if you wish to use special services provided by the University through our website, personal data processing may be required. If the processing of personal data is required and there is no legal basis for such processing, we generally seek your consent. For more information please refer to the data privacy statement of HCU. From Central Station (Hauptbahnhof): Take U-Bahn line U4 (direction Elbbrücken), get off at HafenCity Universität. Take exit contrary to direction of train. Remaining walking time approx. 4 minutes. 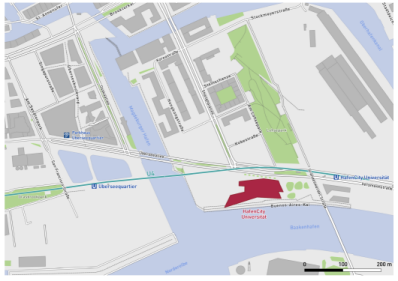 From Airport: Take S-Bahn lines S1 or S11 (direction: Wedel, Altona or Blankenese), change at Hauptbahnhof to U-Bahn line U4 (direction Elbbrücken), get off at HafenCity Universität. Take exit contrary to direction of train. Remaining walking time approx. 4 minutes.